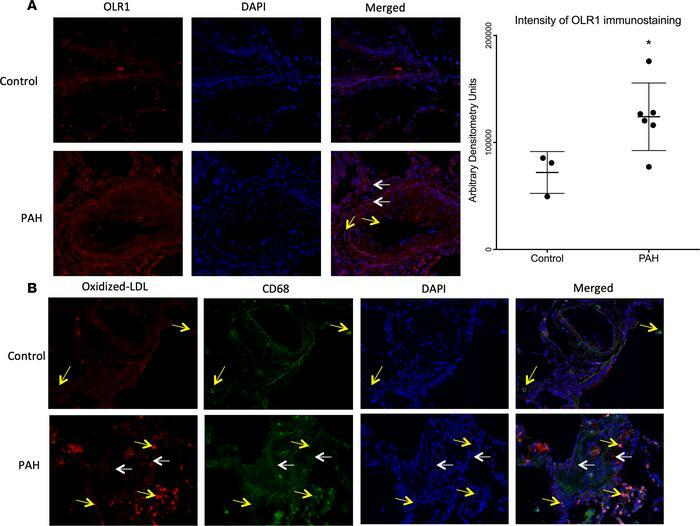 Localization of OLR1, oxidized LDL, and CD68 in distal pulmonary arteries in PAH and control lung. (A) OLR1 (red) is localized in pulmonary artery smooth muscle cells (white arrows) and endothelial cells (yellow arrows). Nuclei stained in blue (DAPI). Original magnification, ×200. Bar graph represents immunostaining intensity in arbitrary densitometric units. Data presented as mean ± SD (n = 3 control, 6 PAH). *P < 0.05 by unpaired, 2-tailed t test. (B) Oxidized LDL is in plexiform lesions (white arrows) and accumulates in CD68+ macrophages (yellow arrows). Green = oxidized LDL, red = macrophages, yellow = colocalized. Nuclei stained in DAPI (blue). Original magnification, ×400.